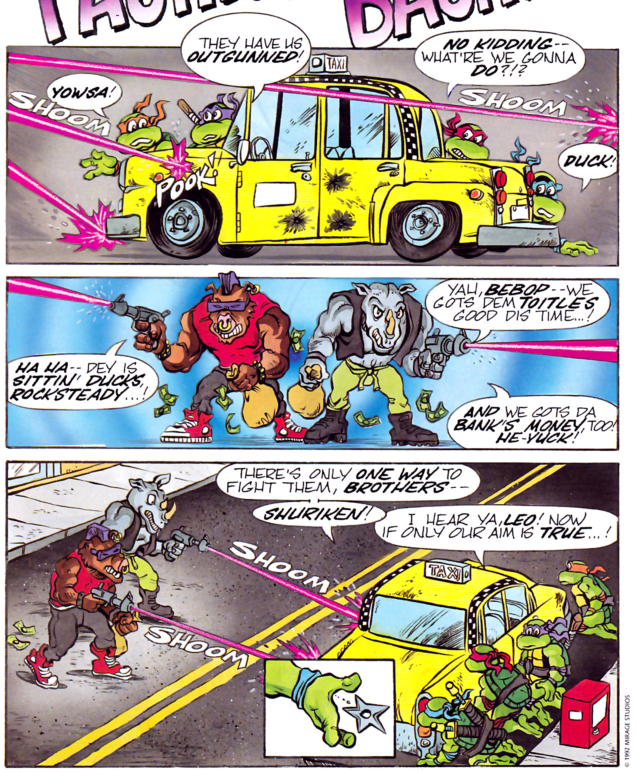 Bebop and Rocksteady have just robbed a bank and the Turtles arrive to stop them. Unfortunately, the evil mutants use their laser guns to pin the TMNT down. Leo takes their weapons out with some well-thrown shuriken and the two disarmed mutants make a break for it. They decide to hide in a department store and do a pretty good job at first, as the Turtles can’t seem to find them. So Leo decides to evacuate the store and the Turtles look for anyone suspicious trying to clear out. They spot Bebop and Rocksteady in drag and another fight breaks out. Eventually, Bebop is subdued by a bottle of perfume and Rocksteady gets his skirt caught in the revolving door, knocking himself out when he hits the glass. Recovering the money, the Turtles mock the fallen bank robbers, with Michelangelo in particular remarking that they were “out of style”. 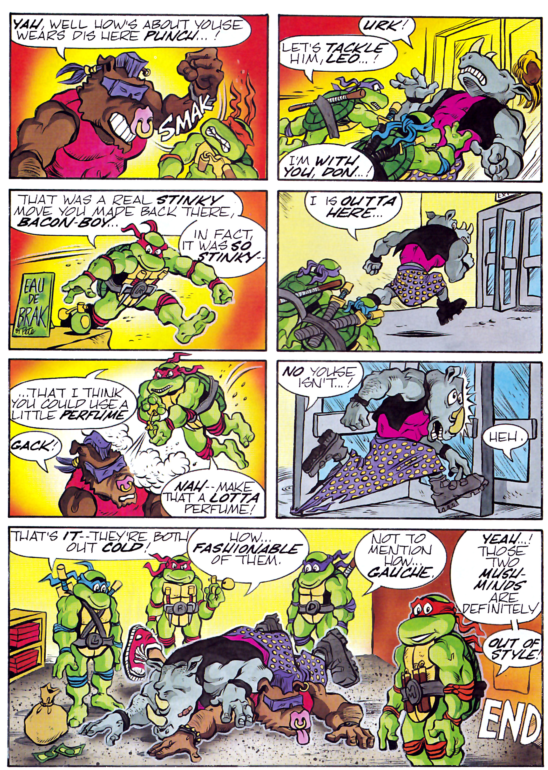 *This story is continued from TMNT Magazine (Welsh) #7. The story continues in TMNT Magazine (Welsh) #9. 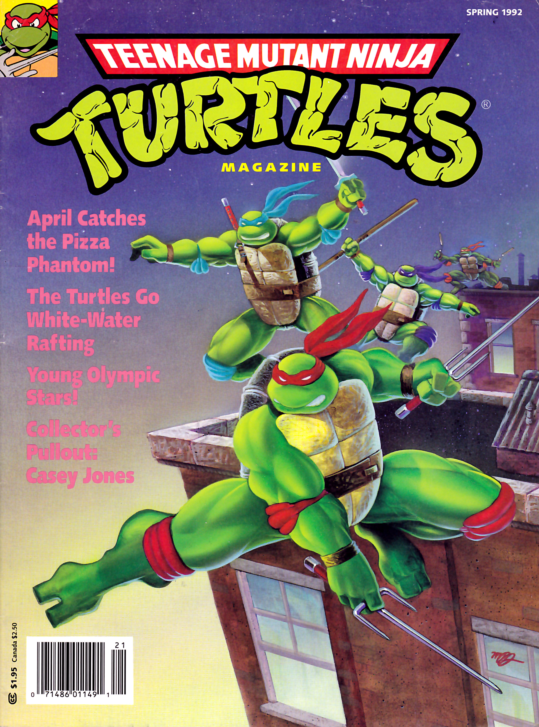 I actually kind of like this cycle that runs through the end of the Welsh Publishing TMNT Magazine series. When the book started out, it was either promoting or pitching action figure characters from Playmates. That segued into an arc about deforestation and pollution. Now, in this last stretch, a number of stories revolve around the Turtles foiling Bebop and Rocksteady. I personally like Bebop and Rocksteady, so the focus turning onto them doesn’t bother me. More than that, they received scant few comic appearances back in the day (getting written out of TMNT Adventures rather early), so any new material with these two is a gift. What’s even more amusing is that they’re presented in these comics as being ne’er-do-wells completely independent of the Shredder. Their schemes range from small time (bank robbing) to VERY small time (as you’ll see in the Halloween issue) and it’s an interesting look at the characters. Like, if they weren’t henchmen to a pair of super villains, this is probably what they’d be doing with their lives. What’s also nice is that Murphy (Clarrain) steps off his soap box for 4 pages and just tells a goofy story (not funny, but goofy). No ulterior motives about sending a political or environmental message to the kids; just the Turtles fighting Bebop and Rocksteady who are in drag. Like I said, it’s not funny, no, but it is a breath of fresh air from all the “special messages” that were suffocating these comics. Anyhow, these comics start to get a little more fun from this point on, possibly at the behest of Welsh’s editors. MOST of the magazine content was educational articles and puzzles; the comics were supposed to be the respite from all that learning. I’m betting they asked Murphy to stop filling them with environmentalist mumbo jumbo and just let them be about fighting and sight gags. Good call. Do Bebop and Rocksteady every get arrested? Or do the Turtles just keep knocking them out and leave them lying around? The latter. They even let them go in a later strip, just 'cause.